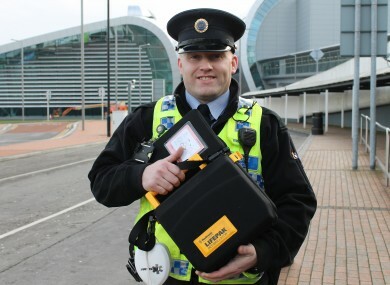 Keith Pedreschi of Dublin Airport Police with one of the life-saving defibrillators. NINETEEN LIVES HAVE been saved since defibrillators were introduced to Dublin Airport a decade ago. The DAA (Dublin Airport Authority) says that three lives were saved by use of defibrillation by Dublin Airport Police and Fire Service (APFS) in 2012 alone. One fortunate person to be helped by the life-saving machine was 85-year-old Jack Healy who suffered a severe cardiac arrest on 2 September last, just outside Terminal 2. A team of airport police and fire service personnel administered CPR to Mr Healy but when he was still found to have no pulse, they used the AED (automatic external defibrillation) before resuscitating him. He spent six weeks recovering in Beaumont Hospital but was fit enough recently to return to the airport to thank his rescuers. Brendan Lavin of APFS said that 80 per cent of reported collapses at Dublin Airport turn out to be simple faintings but that they have to treat each one as a potential cardiac incident. In cases where it turns out to be a cardiac arrest, the defibrillator provides vital time for patients before they can be transported to hospital. As well as the case of Mr Healy last year, the crews on hand in Dublin Airport resuscitated a German man and an Irish woman who both collapsed in Terminal 2, in incidents just a week apart, with both patients later being taken to hospital for recovery. Dublin Airport has been designated a Heartsafe Airport by the Irish Heart Foundation. Email “19 lives saved since introduction of defibrillators at Dublin Airport”. Feedback on “19 lives saved since introduction of defibrillators at Dublin Airport”.